At around 2 a.m. on Saturday morning, Oct. 3, 2015, U.S./NATO forces carried out an airstrike that hit a Doctors Without Borders hospital in Kunduz, Afghanistan. Medical staff immediately phoned NATO headquarters to report the strike on its facility, and yet strikes continued on for nearly an hour. 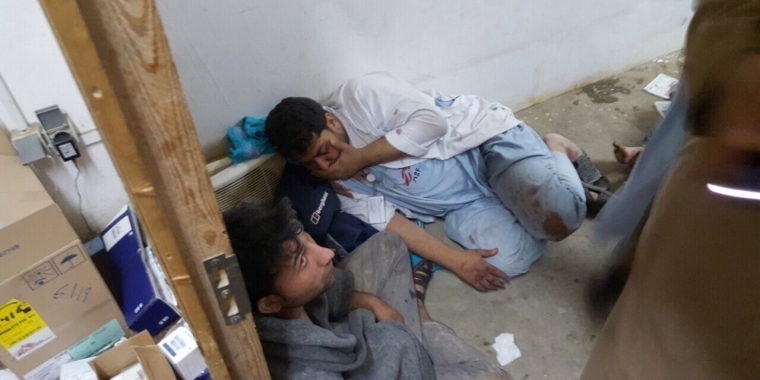 At least nine medical staff were killed and seven patients including three children. At least 35 more people were injured. Taliban forces do not have air power, and the Afghan Air Force fleet is subordinate to the U.S./ NATO, so it is patently clear that the airstrike was a war crime. This occurred just days prior to the 14th anniversary of the invasion of Afghanistan on October 7, 2001, which was itself the "supreme war crime" of aggression against a nation that posed no imminent threat to NATO countries. Foreign forces in Afghanistan are responsible for the chaos that has followed - 14 years on, the war has 'officially ended', yet there are still 12,000 US/NATO troops in the country, and deadly drone strikes occurring more or less weekly. We want to affirm the Afghans' right to medical care and safety, and we want the aggression to end. Only Afghans themselves can engineer their society. If the U.S. & NATO has any role to play at all, it is only to provide reconstruction funds for Afghan-led projects to uplift civil institutions. We urge everyone to vigil at their local hospital to remember, mourn and respect the innocent doctors and patients killed in this war crime. Hold a sign that says "To Bomb this site would be a war crime!" with the subscript "The same is true in Afghanistan."